I am The Watercolor Coach. I can make your dreams of being an artist come true! You can start having successful painting experiences today for less than the cost of three tubes of Cerulean blue. Now is the time to start not just living the life of an artist but thriving and finding more joy than you ever thought possible in your daily life. We can do this! Both on line and off line. So my question for you is "If not now? When? " Sign up for my Newsletter and you will get 25 helpful tips every artist needs to know Free! I hope you will join me and follow the story of how art teaches life lessons in my blog titled What I Have Learned So Far . Please sign up for it by clicking on Blog in the headings at the top of this page. I do publish at least one Three Step Watercolor a week on my blog. There are also lots of free videos HERE that shows the process of how to paint using a "Mass for Value..Mix for color" approach. Don't forget to subscribe to my Youtube channel after watching the video! If you are in need of painting instruction that will eliminate watercolor frustration purchase my book Three Step Watercolors at Amazon.com or by clicking here. My paintings vary in size from 7.9x7.9 inches up to 22x30 inches . 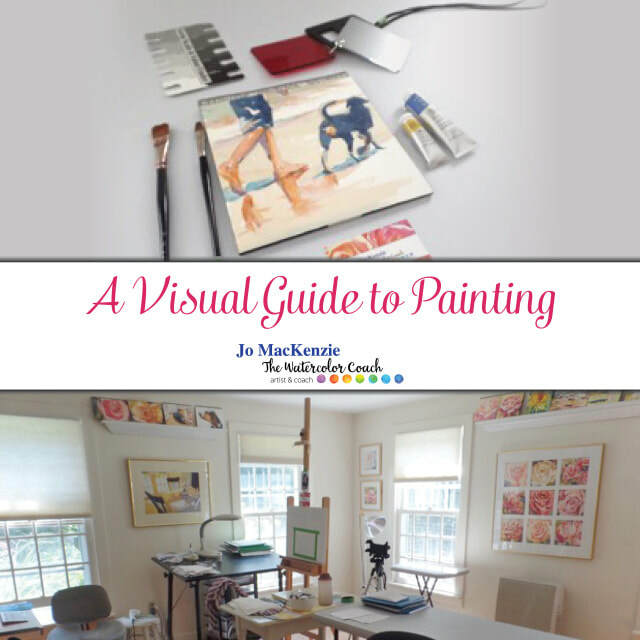 Get Jo's popular downloadable curriculum, " Visual Guide to Painting".